I qualified from Aberdeen University in 1981, trained with firms in Aberdeen and moved to Elgin in 1985. 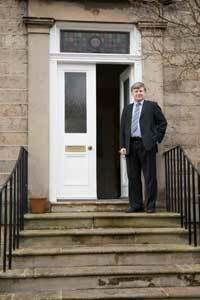 Partnership in the Firm of Dean Thomson & Co., followed and for over 20 years I have specialised in Family Law. In 2008 I decided to form the Firm of Michael Kemp Family Law to provide a specialist family law Firm in Elgin which would continue to offer Legal Aid to clients. I am a member of the Family Law Association, an Organisation which promotes resolving cases in as courteous and non confrontational manner where possible. My hope is that I can make my experience available to you as my client. I have the support of experienced and dedicated staff. Pauline Brennan is a qualified Paralegal in Family Law. She assists clients through the application for Legal Aid although at all stages the case continues to be supervised by myself. Kate Allan has over 25 years experience as a Legal Secretary.